Chef G Garvin at Carver Neighborhood Market! 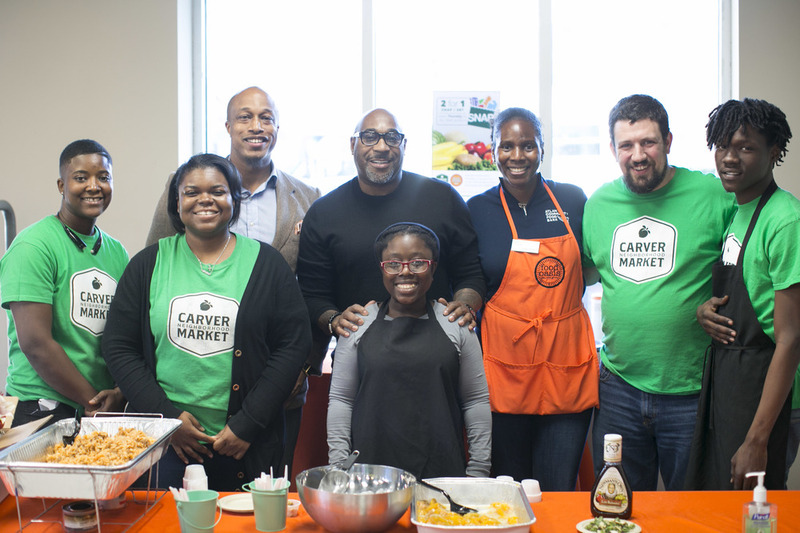 Last week, we had the honor of hosting Chef G Garvin, a celebrity chef, who prepared nutritious, tasty dishes with ingredients all found in the Carver Market! He cooked jambalaya, veggie-packed ground turkey, baked chicken, kale salad, and peach cobbler. Neighbors stopped by all afternoon to taste samples, take a photo with Chef Garvin, or ask him to autograph his cookbook. In fact, this event drew such crowds that it was our busiest day since we’ve opened! This event was also a kick off for our current initiative for customers using Food Stamps - or EBT (Electronic Benefit Transfer). Thanks to a partnership with Georgia Food Oasis and The Arthur M. Blank Family Foundation and the Atlanta Falcons Youth Foundation, we are able to offer double benefits for produce purchases on Thursdays from February through May. In the first three Thursdays, sales of Produce have more than doubled our typical average! We had so much fun hosting Chef Garvin. And we’re excited for additional Chef demos that we will be hosting this spring. Stay tuned for details, and we'd love to have you come by during an upcoming demo!